6 Wall Street - Realtors & Developers Pvt. Ltd.
Blue Square Spectrum At Metro is the commercial evolution based in Sector 75, Noida, created by Blue Square Infrastructure LLP. It provides you with a chain of numerous retail shops, offices, 1BHK, 1.5BHK and 2BHK serviced apartments and is a rich area with world class amenities. The property spreads across a wide area and is recognized by Uttar Pradesh RERA. In which area is Blue Square Spectrum At Metro located?The project is situated in Sector-75, Noida. What is tentative possession date of Blue Square Spectrum At Metro?The project is expected to be delivered by Dec 2020. Is Blue Square Spectrum At Metro RERA registered? Yes the project is registered under RERA. Blue Square Infrastructure is recognized as a premier real estate developer. With decades of experience under its belt, the company is engaged in handling a gamut of projects including serviced apartments, commercial spaces, retail shops and office spaces. It is known for providing projects with proper space utilization and good ventilation. The company is armed with a team of highly talented experts who work relentlessly to come up with exemplary projects that provide utmost comfort to the customers. 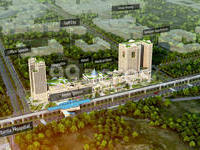 Project Review : The Spectrum Metro, is situated in the sector 75, Noida.  This project is developed by the Blue Squares (Gardenia Group) It,s a purely commercial property. This project is consists of commercial retail shops, commercial office space, studio apartments, serviced apartments, food courts, Multiplex and entertainments facilities. Possession The project Spectrum Metro is under construction. The Possession is expected in December 2019. As per Location This project/property has situated in a very prime location, of the central Noida, with the upcoming sector 75 Noida metro station. This commercial property is just opposite to the posh sector 50 Noida. This project is very well connected to all type of public transport facilities. This property is in the front of the Sector-75 Noida Metro station. The Spectrum Metro location is very prime, and its only centralized air-condition commercial Mall type project in this area that caters residents of sector 74,75, 76, 77, 78, 79, 112, 116, 117 of the Noida. So we can say that this is the excellent location project. This company is a new company formed just 8 months ago. Is this project safe to invest? Sir, please refer my v-card for further discussion. I have taken a office space of 305 sq feet due to its location and CMD manoj ray as he is comparatively a good from other partners. I have also taken as risk but have a feeling that they will deliver it. lets hope for the best.